An inventory of the goods of the Cathedral of Burgos taken in 1797 shows the existence of ‘several stages of the Genesis’, which had been donated to by treasurer Ramón de Campuzano. 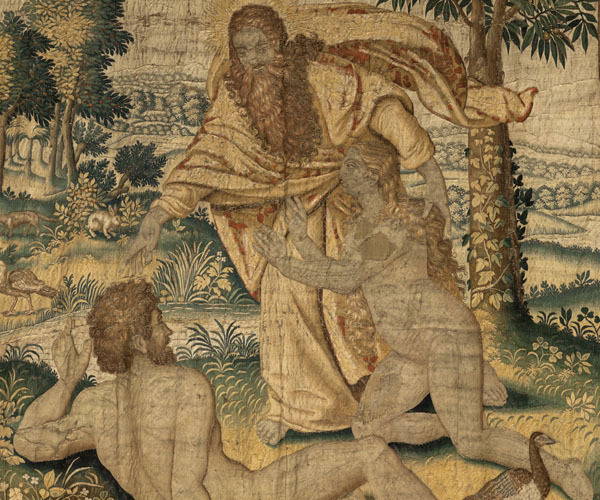 Of a set comprised of ten pieces, from the creation of Adam to the story of Cain and Abel, there is just one currently exhibited in the cathedral museum, which is the tapestry representing the creation of Eve. 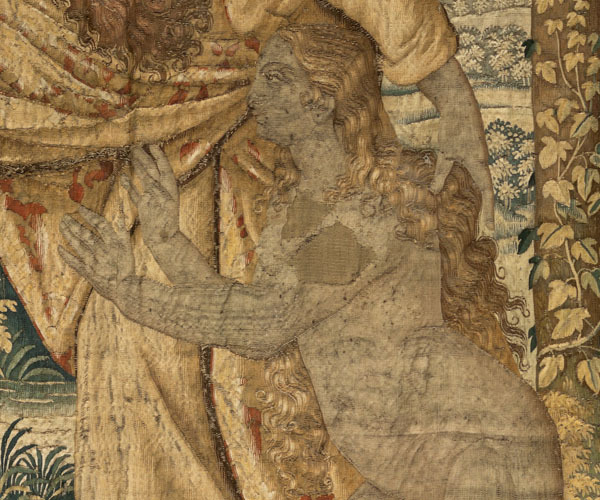 In the mid-16th century, painter Michiel Coxcie made two cartoons which were used to weave the first (princes) series for the King of Poland, Sigismund II Augustus, nowadays preserved in Wawel Castle, in Krakow. 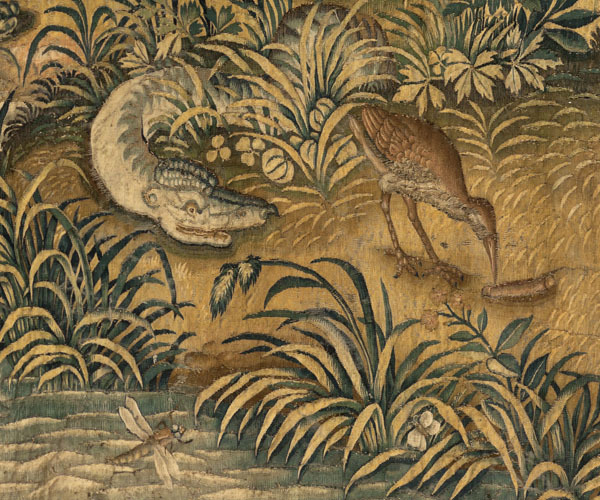 The cartoons were copied and new editions were still being made in the mid-17th century. 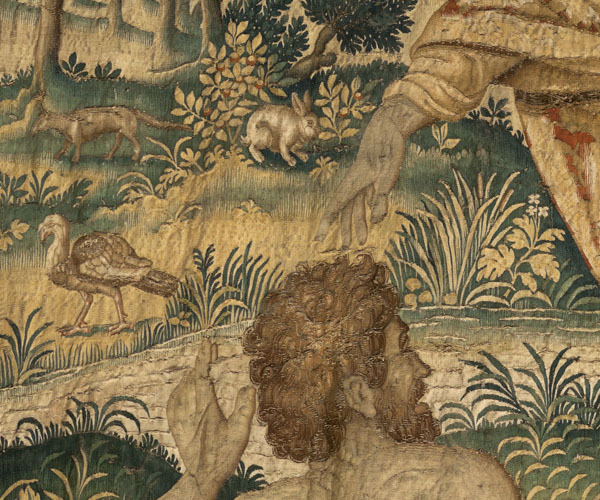 Two of them are kept in Spain: the National Heritage set (series 50) comprised of eight tapestries manufactured by Jacques Fobert and Jan Verboert in Brussels around 1640, and the series belonging to the Cathedral of Burgos. They were woven in Brussels, as indicated by the mark B▼B. The monogram of the weaver Jan Aerst, who worked in the 1630s, is also displayed, so the tapestries in the Cathedral of Burgos must have been made around that date. P. Junquera de Vega and C. Díaz Gallegos, Catálogo de tapices del Patrimonio Nacional. Siglo XVII, Madrid: Patrimonio Nacional, 1986, pp. 80-88. L. S. Iglesias Rouco, “Tapiz del Pecado Original”, in Las Edades del Hombre. El arte en la iglesia de Castilla y León (exhibition catalogue), Valladolid, 1988, p. 45.